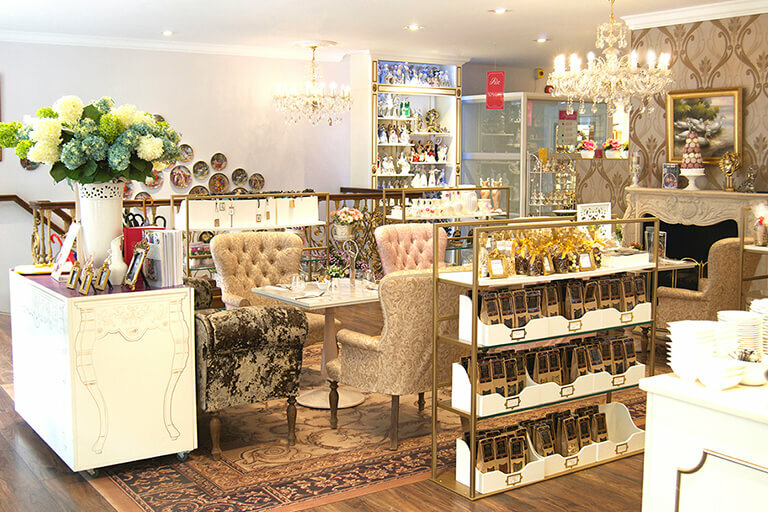 As featured in the October issue of A1 Retail Magazine a new luxury retail and patisserie emporium, Madame Posh, whose name is deliberately tongue in cheek, has opened with views up to Windsor castle. Shopworks, who were appointed by the Madame Posh directors in May 2015 following a competitive pitch, were briefed to design a store that would offer customers a layered experience by marrying a home retail and gifts offer with a patisserie and cafe under one roof. The design concept needed to be enticing, decadent, luxurious yet appeal to all consumer groups, given the deliberately accessible price points. Over two floors, where everything you see is for sale; from the overhead chandeliers, to plates you eat your croissants off and the cups you drink your coffee from, Shopworks’ well thought out approach to the store design successfully showcases the myriad merchandise in a warm and welcoming French luxury style that invites all to enjoy. Large shop-front windows feature tempting freshly prepared patisserie displays, instantly signalling the shop to be more than just home-wares, whilst offering an enticing vista into the Madame Posh world inside. Through the threshold, highlighted walls of luxurious wallpaper feature a gold lustre baroque damask raised encrusted design, with a tactile relief effect and glass beads. Chandeliers and a beautiful rococo style staircase connect the two floors and entice the visitor downstairs, where they can experience the ‘theatre’ of a professional team of chefs in the open kitchen led by award winning pastry chef Martin Chiffers – an expert consultant for BBC2’s Bake Off Crème de la Crème – create beautifully made edible pieces of art. This space has been designed to be flexible, with future patisserie workshops set to provide an added opportunity for customers to delve further into the world of Madame Posh. Shopworks planning for the customer journey in store has been carefully thought out to naturally incorporate both the food and the retail offer to give a seamless, yet intriguing customer experience. Seating throughout encourages shoppers to ‘live’ the Madame Posh experience; they can pick up a coffee and éclair and sit in one of the room sets, upstairs or downstairs, where comfy sofas or elegant dining chairs allow customers to immerse themselves into the world of Madame Posh. They might choose to sit by the fireside, or in the ‘fun’ vintage bath, which was found, cut out and up-cycled into a gold painted ‘sofa’ and softened with crushed velvet cushions. Or customers can simply browse for a special gift or home must have, where the mid-floor merchandise grandly feature on units designed by Shopworks to carry through the elegant and decadent feel, with hand painted Marie Antoinette inspired reliefs on the French styled box furniture. With an eye on cost efficiency and future rollouts, Shopworks specified highly flexible perimeter wall units that offer adjustable shelving, drawers and clever store furniture configurations. Perceived ‘cold spots’ throughout the store have been addressed with core destination categories or visual displays to ensure that the every inch is carefully considered for maximum shopping appeal. Outside, Shopworks has designed a space for alfresco eating where passers by are encouraged to stop, take a seat, a coffee, breakfast, lunch or tea whilst enjoying unrivalled views to Windsor castle. The location on the upmarket and pedestrianised Peascod Street was carefully chosen to benefit from its high tourist footfall and now both locals and visitors can enjoy shopping and eating in a new kind of store never before seen before in the streets of the Royal Borough. “It has been such an exciting challenge for Shopworks to design a store concept such as this. Working with the team at Madame Posh has been a rewarding experience of shared enthusiasm to bring this gem to life.” Concluded Phillipson.